Are carpet, tables and chairs included in my booth price? Tables and chairs may be brought in by the exhibitor or ordered, if needed. If you need to order tables, carpet, table skirting, chairs, flood lights, etc for your booth, K&J Convention Decorators will be available on location during the entire show. They will mail the information on rental prices to you prior to the event. You can also contact them at (406) 442-3238. Is electrical service included in my booth price? Yes. You get one 110 volt, 500 watt electrical outlet (equal to 2 standard plug-ins) with each booth. Additional electricity may be contracted at your expense with K & J Convention Decorators. Can I sell my product from my booth? Yes! Not only CAN you, but we strongly encourage sales! Exhibitors have their own parking area by the back loading door on the north side of the building. All cancellations must be in writing. A cancellation occurring 120 days prior to the show results in the loss of deposit. Cancellations within 90 days of the show result in the loss of all monies paid to date to cover expenses incurred by the Home Builder’s Association on behalf of the exhibitor. The office is located at 327 2nd Street South in Great Falls. Who should I contact about the Show? You can call Katie at the Home Builders Association of Great Falls at (406) 452-4663. You may also email at [email protected], or come see us at 327 2nd Street South. Can I ship my display to the Expo Park? Yes, you can. Please contact Katie at (406) 452-4663 for more information. Where do I pick up my exhibitor packet? There will be a table set up at the north entrance where you can sign in and pick up packets. Am I allowed to drive in on the floor during move in/move out? Yes, you may drive into the building. You must stick to your assigned move in time and we ask that you drive in, unload your items, and drive out. Please do not leave your vehicle there while you set up your booth. It hinders the process when people are waiting to get in. How secure is my booth after hours? We have a security company that walks the premises at night. However, as an extra precaution, anything of value should be removed from sight or secured before you leave your booth for the evening. Can I pass out flyers or similar promotional materials outside of my booth? No. To ensure fairness for all exhibitors, all exhibitor business must be conducted within the booth only. How is the Home & Garden Show & Sale promoted? The show is promoted through various media. The newspaper, radio, television, and billboards are all used to let people know that the show is coming! Customers coming through the doors of the 53,000 sq ft Expo Park arena and the 15,000 sq ft Exhibition Hall, the opportunity to showcase your products and services couldn’t be better! 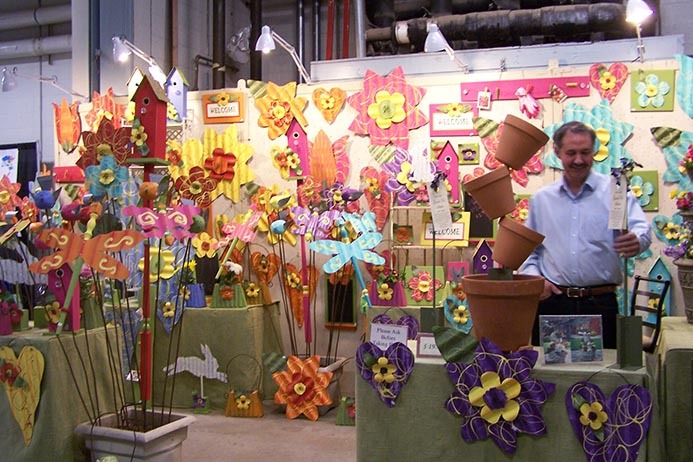 The Great Falls Home & Garden Show & Sale is in it’s 37th year. It’s tried and true! Many customers wait until THIS SHOW to purchase products/services for their home and garden. It’s a yearly tradition and people know they can find all they’re looking for in one location. Dollar for dollar there is no other market that will deliver you more qualified prospects than the Great Falls Home & Garden Show & Sale. You will connect with potential buyers looking to find inspiration from the latest ideas and trends in landscaping, home improvement, backyard living, home décor, custom furnishings and home maintenance. Where else can you showcase your products and services in front of thousands of prospects each and every day?